When I watch films I tend to get overly involved with the story, I start imagining what my life would be like if I was there. I start trying to relate to the film in ridiculous ways. It probably explains my love for simple films; like Amelie and Sabrina, because that’s exactly how I would like my life. 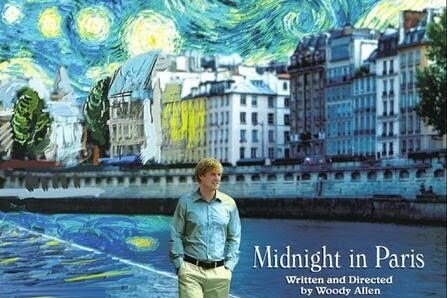 More recently, aka today I watched Midnight in Paris; it was amazing, and my first Woody Allen film gasp! It got me thinking about how much of my time is spent thinking of the past. Also how much I love Paris. I don’t generally talk much about myself, or maybe I do, but hey this is my little bit of the internet and you mostly don’t know me. And you definitely should, so this is stalking Rachel 101 lesson 1. I like old things quite a lot, I like old books and old music because generally they have stood the test of time, they are well made, sturdy and dependable. Much like this guy, sorry that’s a bit sickly, with valentine’s day around the corner it must all be going to my head! This isn’t to say I don’t live in the now; the two should meet. In fact where they meet is a vintage store, and those places are amazing! I’m trying to channel the whole ‘quality over quantity’ as of late, because it seems like a lot of people have forgotten. Also I have to save money. My point is classics: time-tested, filled with love, amazing quality, classics! My favorite classic recipes, the songs I live my life to and the styles that I love will all be lovingly made, listed and photographed for you to decide how much you love me/ hate me/think i’m a hipster. It will be splendid. But also what are your classics? that’s important too! Let me know yeah, cool, awesome. Also that cheesecake I mentioned in the last post, mega flop, the Miette cookbook is something that inspires me visually but recipe wise has let me down in reliability. I did however make a strawberry milkshake flavoured cake, I’ll try to find some photos from the night and there will definitely be a recipe.